This is a guest post written by Katie Jones from Orla James. Since you’ve decided your wedding date, have an idea about the menu, venue, and guest lists, it’s now time to concentrate on how you’re going to capture all these memories. Your wedding day is probably going to be the most beautiful day of your life. Most of us have been dreaming about this day since we were children, and if not dreaming, then we at least know what we want for ourselves. There will be a lot going on during the wedding itself and you might not be able to enjoy every detail that you’ve thought through. Katie from orlajames.com says that if you’re busy mingling, you might miss the entrance of your grandparents, or you might miss the pretty flower girls playing hopscotch with each other. There are always umpteen things that you might want to be a part of. At such a time, it is only the photographs that will capture all these perfect moments from your wedding. You owe it to your partner, any future children, and family members to make this day as memorable as possible. You should also be able to revisit your memories through these photos whenever you want. Let’s look at some ways in which you can find and work with your photographer to capture perfect wedding photos. We advise couples to start their wedding photographer search as early as possible. Some couples start searching a year prior to their wedding date. Start searching early by asking your friends, family members, and colleagues. Most wedding photographers have a ready portfolio that you can refer to – either online or in print. 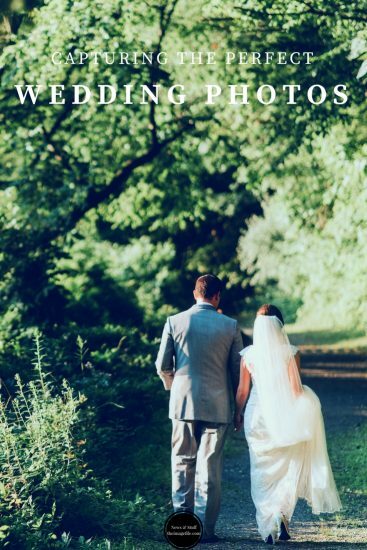 When selecting a wedding photographer, pay attention to the different types of photos clicked, the variety offered, galleries captured, and candid shots taken. Before you visit or interview any photographers, have a list ready of all the shots you want to be clicked at your wedding. You can flip through some wedding magazines available at magazine stalls to get a basic understanding of which shots you might like. Another way to do this is to browse through couple photo shoots and wedding photos online so that you are able to make your click list quicker. If you want to ensure your pets are featured, make a note of that too! Many photographers are very busy, especially during wedding season. Meet them well in advance or set up a video chat so that you are able to speak with them and understand whether they are able to see the vision and theme that you have in mind for your wedding. You should hit it off with your photographer since he/she will be with you at every stage of your wedding ceremony and functions. Your photographer could click photos of the bride when she is getting ready, her makeup, and also teary farewells with the families. The same goes for the groom. You must be able to build a good healthy rapport with your photographer. The best way to ensure that you are able to get the best photos is to schedule a photo shoot with your partner present. This also helps in rapport building with your photographer. You are able to speak together and share your views as the photos are taken. This is also the ideal way to share your feedback on the spot. Make your views clear and let your partner also discuss the best poses, pictures, and styles that he/she would like. Make it a fun day, and you will get additional memories to last a lifetime. This also saves you the additional cost of a ‘Save the Date’ type of photo to send to your friends! Always check the references of your photographer – speak to other couples who have worked with the same person earlier. Also, read through the contract carefully, and check all minor details before you sign and pay an advance. Ensure that your contract includes the correct date, production details, colour schemes, stills, video shots, portraits, candid shots, and post production process. Just enjoy your wedding day. Rest assured that the photographer has understood what you want to be done with the lighting, scope, angles, and people at your wedding. Ensure that everything is on schedule, there are no delays, and that everything runs smoothly so that your photographer is able to click photos of all the moments you could have missed during the ceremony itself. Don’t keep looking for the camera, it is around, clicking away, and creating life long memories for you!